Radon gas is a serious health risk and the primary environmental hazard in the United States. Because radon is a colorless and odorless gas, many homeowners do not feel compelled to ensure radon infiltrations are eliminated from their homes. While radon gas is a common element found in soil and rocks, it is only considered harmless when released into unconfined air such as in crawl spaces, basements, and buildings. Radon is a natural radioactive decay by-products of uranium, contained in soil and rocks. 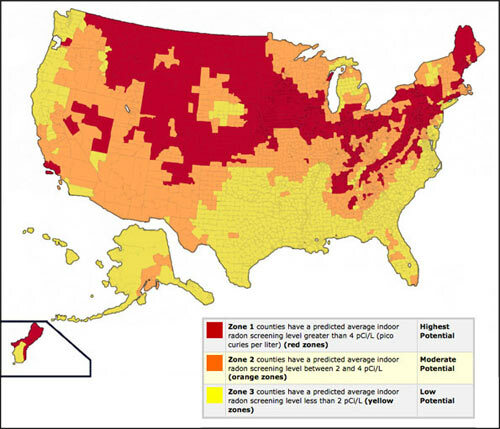 Radon zone map showing the prevalence of radon gas throughout the United States. The sources attributing radon exposure to lung cancer are numerous. They have conducted studies to support findings that estimate 21,000 deaths per year are from lung cancer caused by radon gas inhalation or radon gas ingestion. Deaths from radon exposure in lung cancer patients are second only to deaths from lung cancer caused by smoking. Because there are no overt signs or symptoms of radon exposure until cancer is diagnosed, homeowners are unaware of the importance for radon measurement and radon mitigation. Radon can enter any home or new construction despite the overall condition of the building structure. Radon zone Maps are published by the EPA, estimating the individual averages of exposure for each state and county throughout the United States. While the EPA has made a valiant effort, these figures can only provide a rough estimate of the radon exposure risk in the specified geographic locations. The zone ratings are not accurate for each individual piece of property or building structure within each region. Concentration of naturally occurring radon gas in the environment. 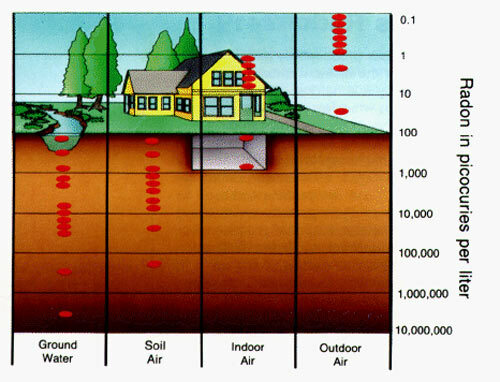 Radon levels in outdoor air, indoor air, soil air, and ground water can be very different. Wet or moist crawl spaces can contribute between 10 to 15 gallons of water in the form of vapor throughout the home each day. Water vapor enters the crawl space through concrete walls, slabs, foundation blocks, vents, and the soil. After entering the structure, the water vapor travels upward throughout the home and eventually deposits as water condensation upon encountering the cooler surfaces of walls and ceilings. This water vapor is an ideal conductor for dispersing radon gas and other pollutants throughout the home. Often this water vapor is so fine that the average homeowner would not detect it. Even closed crawl spaces, which are effective at increasing the overall indoor air quality, may collect radon in the enclosed space. As seen above, radon can be dispersed in the home through the faucets and drains. Stomach cancers resulting from radon ingestion of well water is much lower than lung cancers from airborne radon, but any undue risks are unacceptable. The only assurance of getting an accurate radon level inside your home is to measure it or hire a certified radon mitigator for the task. How radon gas enters your home. Even if you do not have well water, it is recommended your home be tested for airborne radon. A certified radon mitigator would provide the most accurate radon levels and most appropriate recommendations. However, homeowners wanting to conduct their own tests can purchase radon test kits at local hardware stores, home improvement stores, and on the Internet. Radon test kit coupons are available from the National Safety Council. Most kits include a testing device, instructions, and a postage-paid mailer envelope to send the testing devices for laboratory analysis. Be certain the laboratory that manufactures and analyzes the testing device is certified for radon detection. The National Environmental Health Association has many national radon resources and state radon resources and can be consulted for locating both certified radon professionals and certified radon laboratories. Prior to purchasing a test kit, you may want to read more detailed information about radon testing contained in the EPA Checklist. The short-term testing method is good for a snapshot overview and is offered in two- to seven-day time period formats. Time of year - Radon level fluctuations exhibit seasonal variations. Usually the highest levels occur during the heating season, when homes are closed up for longer time periods. For the long-term method, it is best to choose a time period spanning both the heating and non-heating seasons. Test location - Choosing to test in the basement or main living area in slab-on-grade homes are usually the best testing locations. According to EPA data, radon levels are typically highest in the lowest living areas of the home. Weather patterns - Short-term tests are sensitive to extreme weather conditions. Try to select a time period that is free from stormy weather or high winds. Test interference - Understated levels will result from actions such as moving the test device or opening doors and windows during the test. Follow directions - Inaccurate levels will result from failure to follow the kit instructions. The scientific data has been specifically designed for consistency in radon testing methods. Test devices should remain in place for the required time period; completely fill out all required information, and mail the test device to the laboratory immediately upon completing the test. Most airborne reduction systems require the mitigator to follow three stages to effectively reduce radon levels: diagnostic evaluation, sealing of the foundation or crawl space, and installation of the system. The radon contractor will use their knowledge and skills to design the most cost-effective and correct system for your home. Radon mitigation systems are available to remove radon from the home. 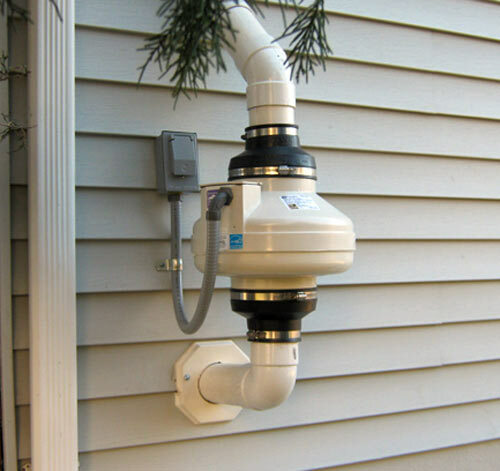 Airborne radon systems work by altering air pressure beneath your home and drawing out radon gas through one or more pipes to the exterior of the home with a specially designed radon fan. The systems are usually routed through the interior of the home, through the garage, or to the exterior, often venting above the roof line. The most popular type of installed system was formerly called sub-slab depressurization or SSD. It has been renamed to active soil depressurization or ASD. Another emerging method involves the installation of a heat recovery ventilator designed to ensure the optimal indoor air quality. Experienced mitigators will require the following for waterborne radon reduction prior to recommending the best system and location: assessment of the waterborne radon level; complete water analysis, identifying the presence of other contaminants; and measurement of the water flow rate. Your preferences should be taken into consideration along with the plumbing, electrical, and venting requirements. The two most common types of waterborne radon reduction systems are aeration and granular-activated carbon or GAC. The key factor in selecting the most appropriate system is the radon level. The EPA does not recommend GAC for radon levels above 5,000 pCi/L. The aeration method is rated by the EPA as the best available technology or BAT. Other methods, such as GAC, may pose the threat of waste buildup. The design of aeration systems allows radon gas isolation from the well water, venting the contaminants safely above the roof line. GAC systems require more meticulous maintenance, or problems with radioactivity or ineffectiveness may result. GAC systems use one, two, or three carbon beds or tanks where the radon is adsorbed. If the tanks are left in place too long, the carbon becomes ineffective and possibly contaminated. When properly installed and serviced, they are effective. Therefore, it is necessary to service GAC systems by ensuring the tanks are changed in a timely manner. Usually annual replacement suffices, but may differ according to the well water quality and levels of contamination. Considering the serious health risks and difficulty in detecting radon gas, it is highly recommended that homeowners and business owners consult the services of a certified radon contractor/mitigator when radon levels have been confirmed to be elevated. A complete overview of radon gas concerns, can be reviewed in one of several EPA publications. These professionals have been trained, tested, and certified in effective radon concern resolution according to the standards set by the National Radon Proficiency Program or the National Radon Safety Board. They will address radon concerns and most will provide a free estimate for the design and installation of an effective radon reduction system for your home. Do not delay making a decision about assessing radon risk in your home You and your loved ones cannot afford to take any chances in ignoring the recognized health risks of radon gas! Tip #123. Why are a majority of homeowners unaware of the importance for radon detection? There are a number of contributing factors on why homeowners have not been well-informed despite recent public announcement promotions chiefly through the EPA. Because radon is a natural decay element, no particular agency or company is responsible for its detection, removal, and damages. Many homeowners see this as a potentially high expense without fully weighing the severe consequences.